Nature reserve "the drowned land of Saeftinghe"
General. 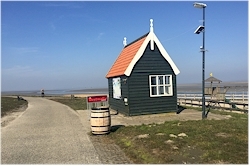 This reserve is located in the north-eastern corner of the community of Hulst, at the banks of the Scheldt River. 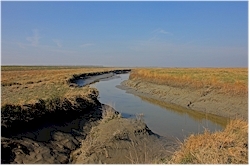 Its surface covers more than 3500 ha and is mainly composed of marshland that is under continuous influences of the tides of the North Sea. 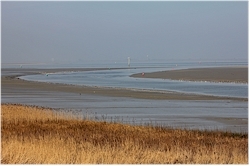 The water in the reserve is brackish; a combination of the sweet water of the Scheldt River and salty seawater. The marshland created a rich vegetation and is a paradise for the birds that live, nest or stop here on their yearly migration. The place also gives you a good idea of how the coastline in Zeeland and Flanders must have looked like before dikes were built. Hiking in Saeftinghe. There are several possibilities to walk in the area. The first one is via the sea dike. 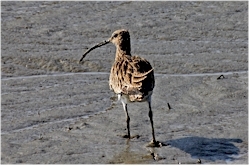 This is the easiest option and from the top of the dike you have a great panoramic view on the reserve. If you want the enter the reserve itself, then you have the choice between the boarded footpath ("Plankierpad") or the so-called rough boots trail ("Ruige Laarzen Route"). Bear in mind that you cannot enter the reserve at high tide so it is wise to consult the tide table beforehand. The "Plankierpad" is a sign posted path that has been partially equipped with boards for the convenience of the visitors. Make sure that you have some proper shoes with a firm grip because (depending on the tide) the pathway can be slippery and soggy or even very wet. If you are a bit more adventurous, then go for the rough boots trail (take into account that your clothes will get dirty). If you want to see even more, then you will have to go with a guide. This is for your own safety because the tide can rise very fast and the last thing you want is to get boxed in by the surging water. Paal and Emmadorp. These two villages lay next to the reserve just inside the large sea dike. Emmadorp is a small place consisting of a few houses and farms. For a while it has a harbor; a commemorative plaque on the dike reminds us of that. The visitors center of the natural reserve is located in Emmadorp. Paal can be found a bit further downstream and consists of collection of small fisherman's houses and farms built at the foot of the dike. There are a few eateries here and it still has its tidal harbor. Visitors center. The visitors center of the reserve is located in the village of Emmadorp. From here you can enter the reserve itself. There are toilets, changing and washing rooms. There is a parking but it is not very big. How to get to Saeftinghe? It's best to go there by own transport. If you come by car, then you can park at the visitors center. The only entrance to the reserve is in Emmadorp. The flat polderlands are ideal for bicycle tours. » How to get to Saeftinghe?